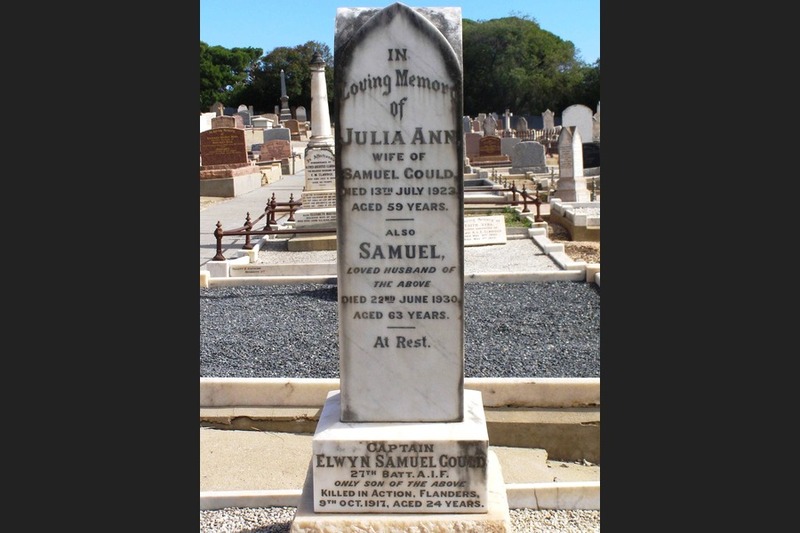 Elwyn Samuel Gould (my uncle, whom I never knew) was the only son of Samuel and Julia Gould, born in Bowden (a suburb of Adelaide) in July 1893. He had six sisters, two older and four younger than himself - all of whom I knew. 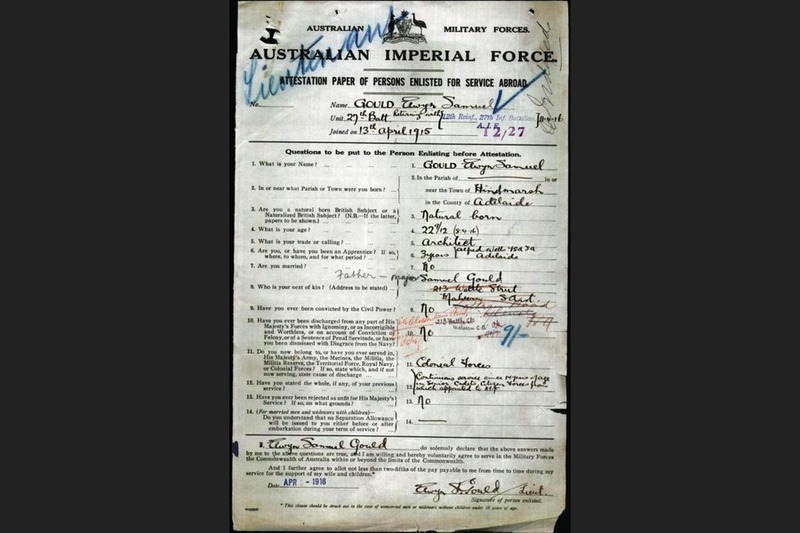 He progressed well at school and had almost finished qualifying as an architect at the time of enlistment in 1915 in the Australian Imperial Force. 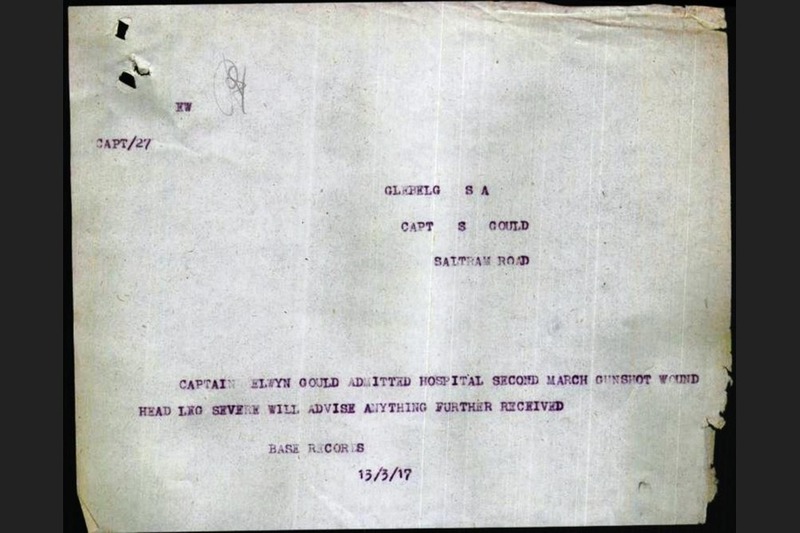 Elwyn Gould served at Gallipoli but was invalided out with enteric fever, first to a hospital ship in Malta and later on three months' leave to Australia early in 1916. 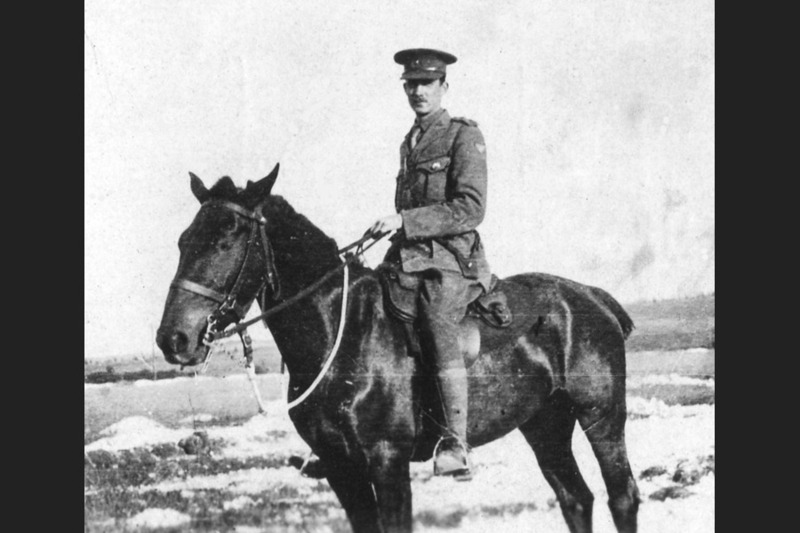 He returned to active service in France in 1916. 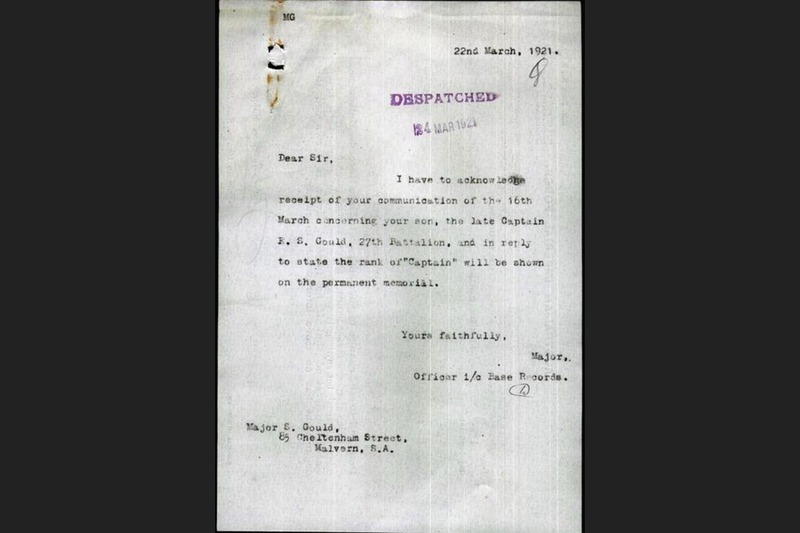 He received serious gunshot wounds in France on 1 March 1917 and was sent to Wandsworth Hospital in London to recover. 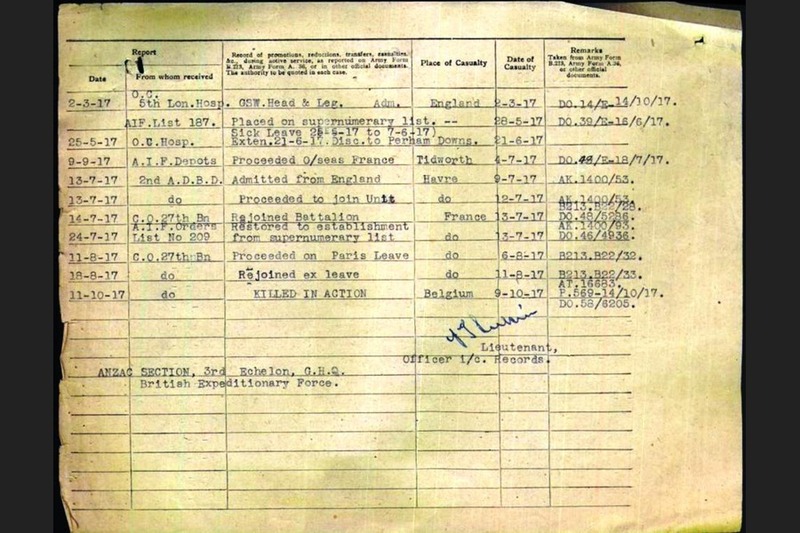 His recovery was successful and he returned to Europe in June 1917, rejoining his battalion in France in July. He was to live for only three more months. 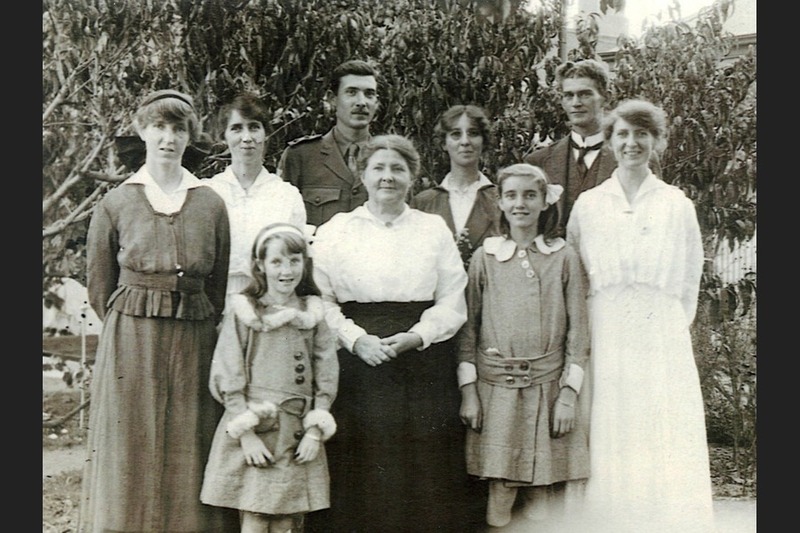 The photographs are of Elwyn himself after he had enlisted in the AIF, including one with his mother, six sisters and his oldest sister's husband (taken by his father when Elwyn was in Australia on leave in 1916 - sadly, the last time his family saw him; my mother, aged 8, is at the front). 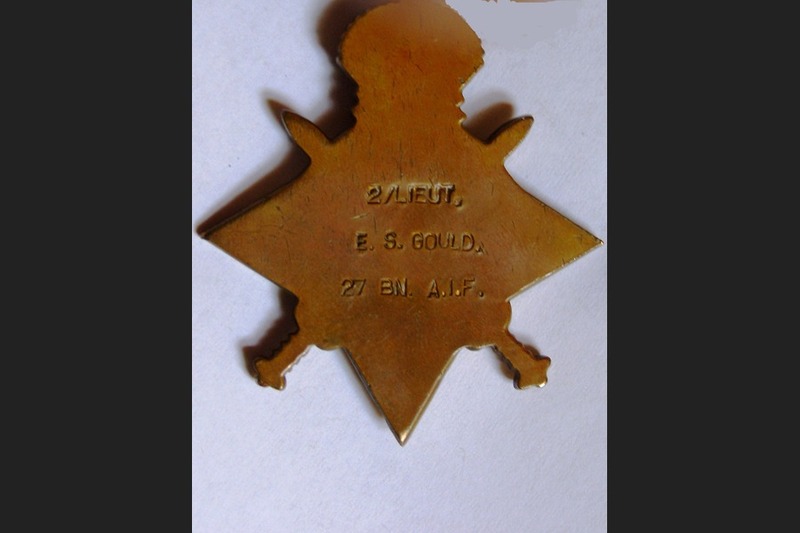 His 27th Battalion badge and the name on the back of his 1914-15 campaign star are shown (these are in my brother's possession). 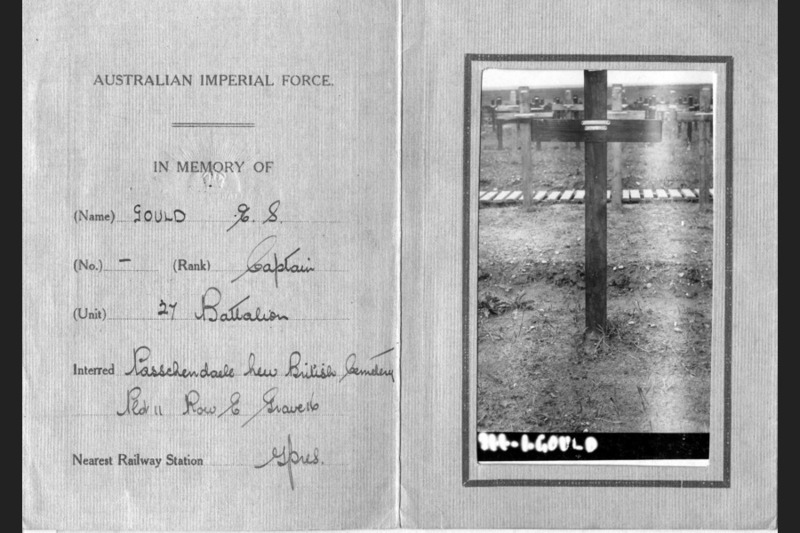 The other photos include the card sent to the family in 1921, showing the original cross on his burial site in the New British Cemetery near Passchendaele. Today, the grave has a standard white memorial headstone, with his name carved on it. 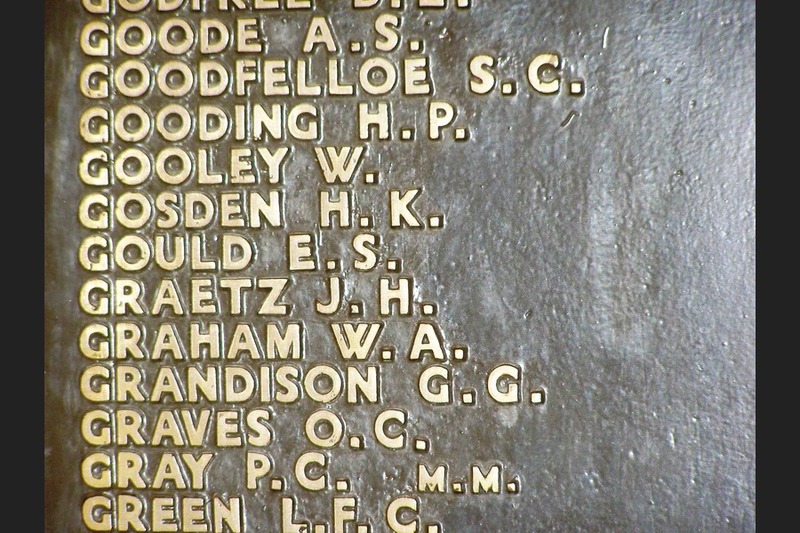 Also shown are his name listed on the war memorial in North Tce, Adelaide, and on his parents' gravestone. 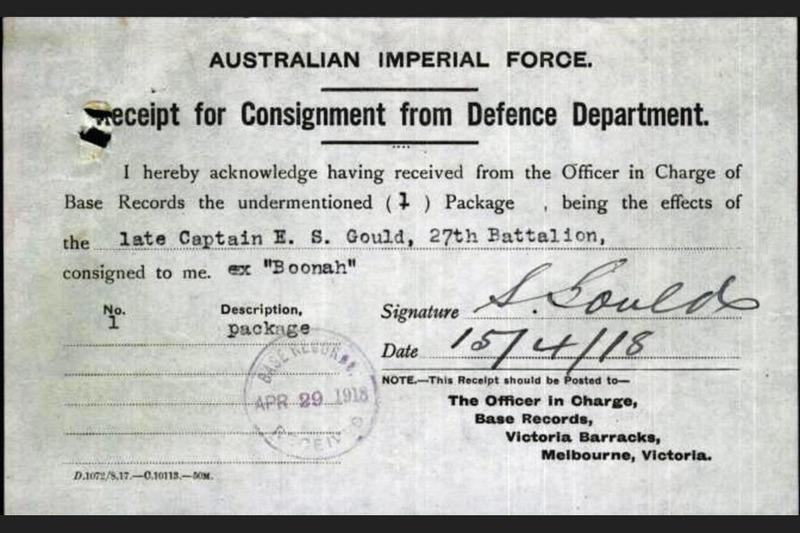 The files are some of the more than 100 pages for Elwyn Gould now made available on the National Archives of Australia database of World War I records. 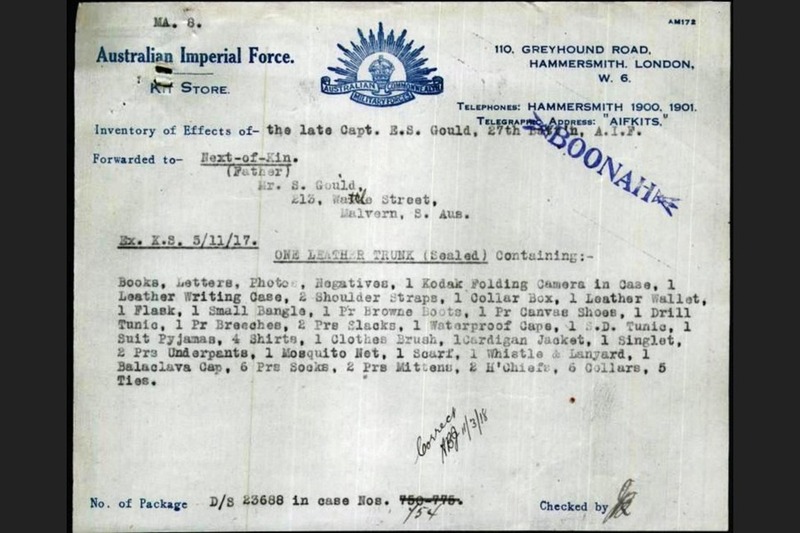 I have selected the ones that tell the story of Elwyn's service and interactions of the AIF with the family about various events, in a way that I hope illustrates what it must have been like for the family back home when communications were much slower than they are today. 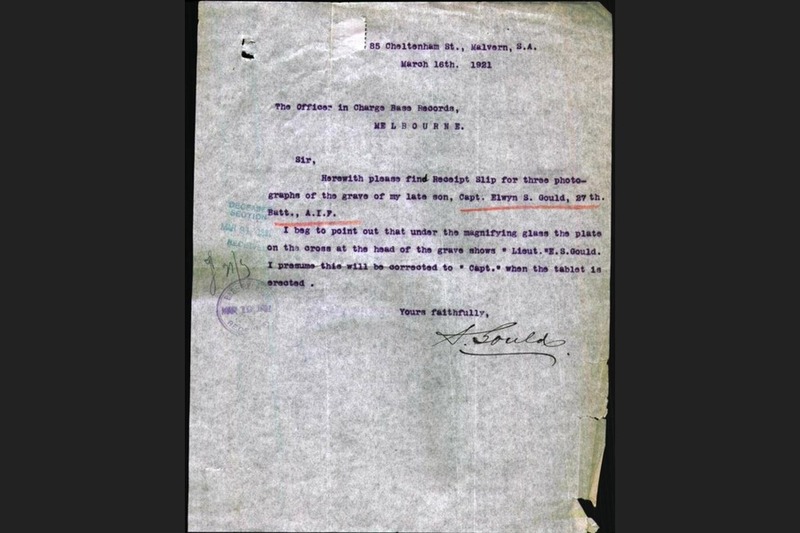 It also shows the thoroughness of army records but the rather perfunctory way in which it was necessary for them to communicate when they had to attend to so many matters with so many people about so many events, some of them harrowing for the families to whom they had to be sent. 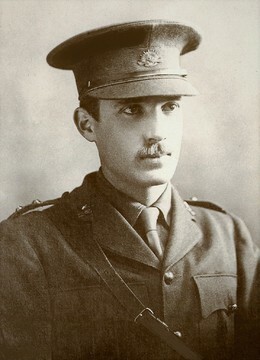 Elwyn Samuel GOULD was born the only son of Captain (later Major) Samuel Gould and Mrs Julia Gould, at Bowden in Adelaide on 13 July 1893. 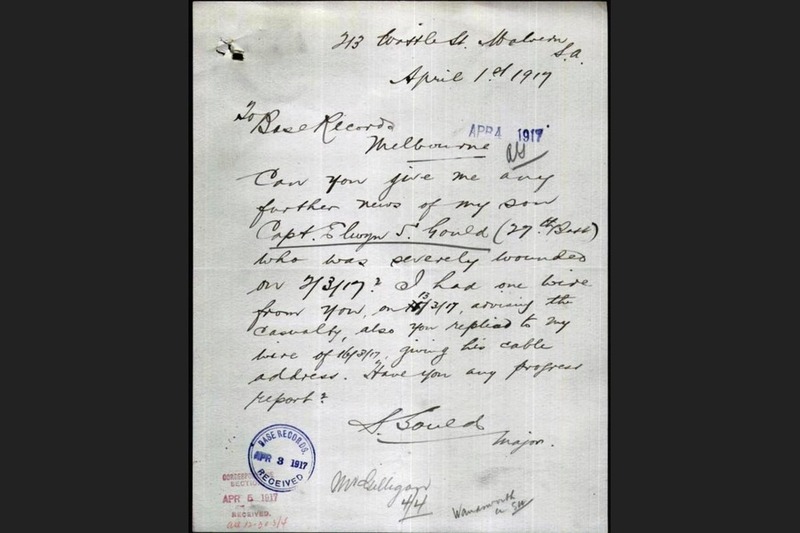 Samuel Gould was a militia officer and his son Elwyn had joined the Cadets at age14, progressing into the ranks of the Citizens Forces where he was commissioned prior to the outbreak of war. Elwyn studied as an architect completing his studies immediately prior to the outbreak of war. 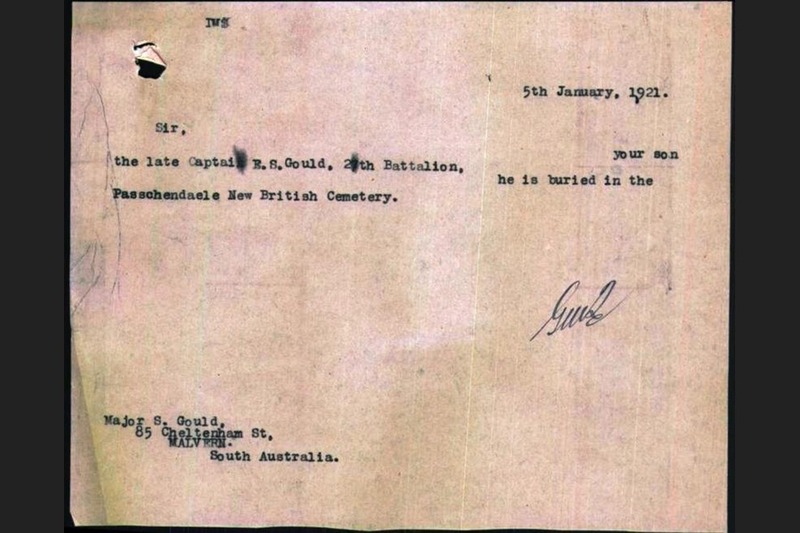 He was commissioned to the AIF from the Citizens Forces enlisting on on 13 April 1915. 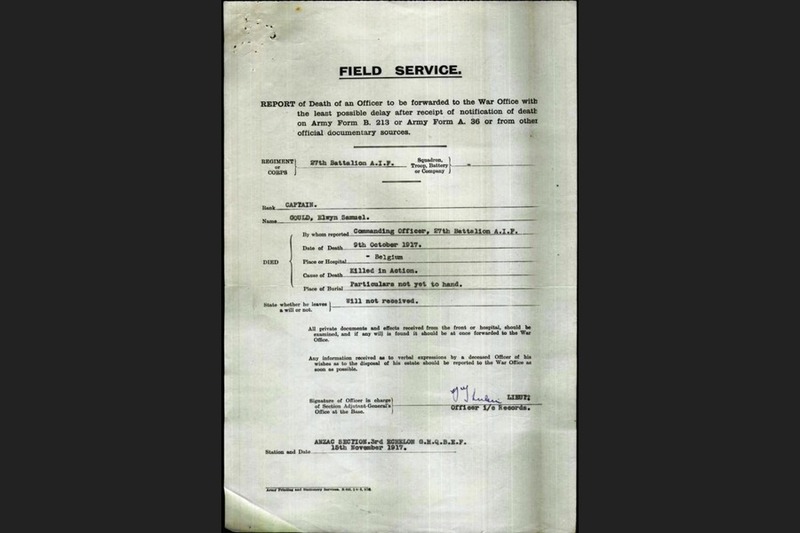 He thus had no Service number allocated as was the practice at the time; only enlisted personnel were thus identified. His parents by this time were living at 213 Wattle Street MALVERN SA . 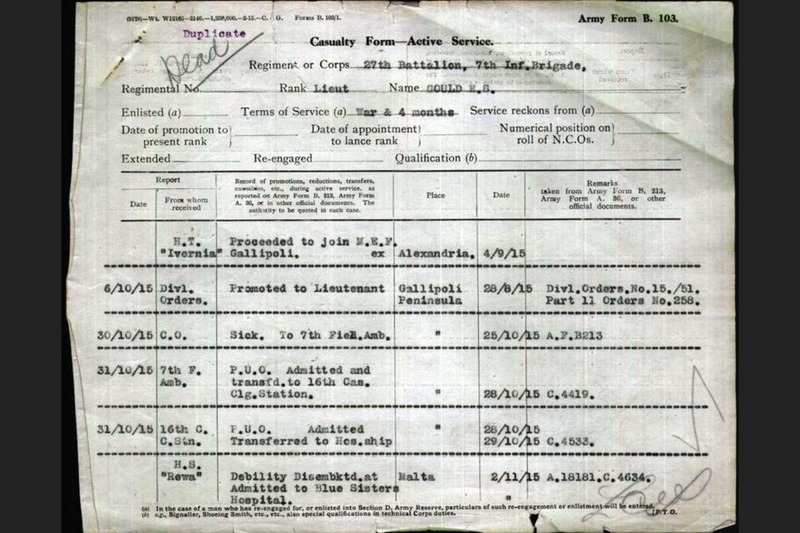 Elwyn 's name is not listed on the embarkation roll for his initial deployment for reasons unknown. This anomaly will be brought to the attention of the AWM. 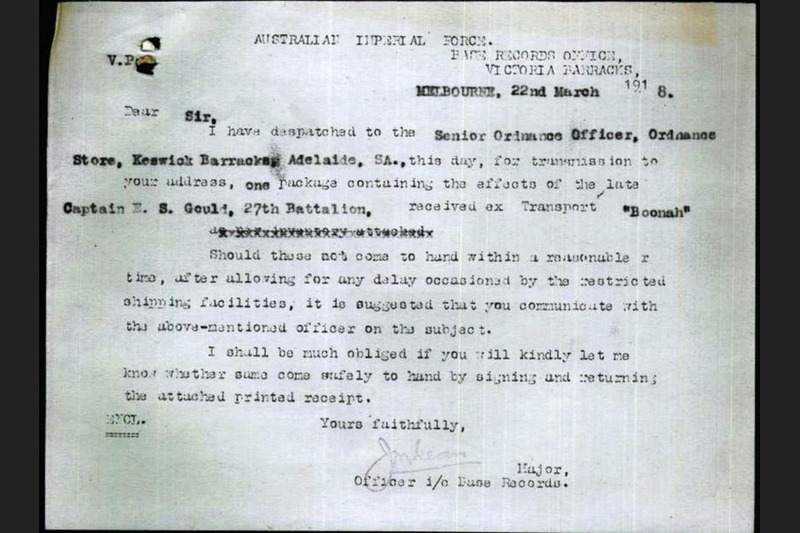 He returned to France from Australia and the UK (an entry that IS recorded in the Embarkation Roll) as part of the 12th Reinforcements for the 27th Battalion, on the HMAT Aeneas embarking on the 11th April 1916. 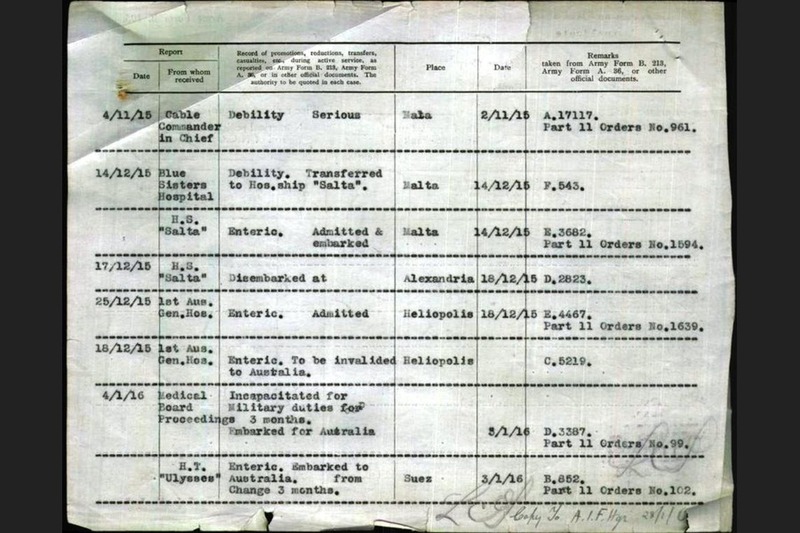 Elwyn re-joined the Battalion, by now a very different collection of faces and names to the one he had left behind at Gallipoli. 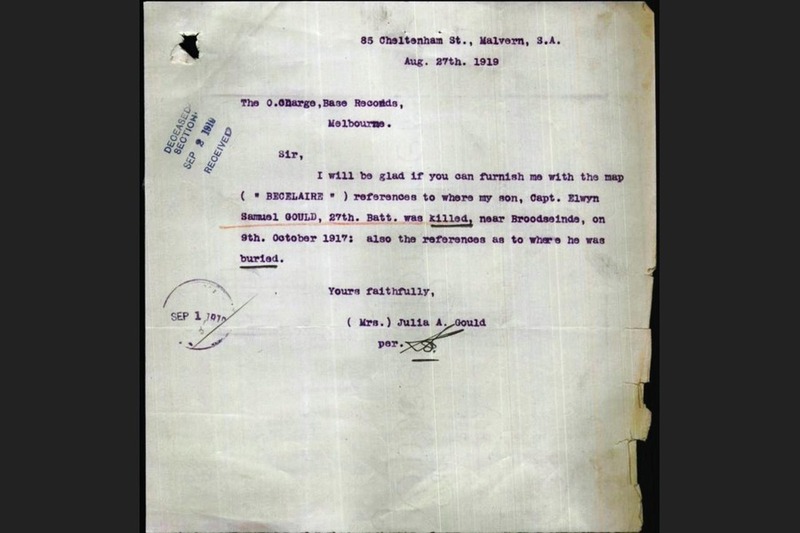 The 27th Battalion took part in operations at Pozieres and Mouquet Farm in July - September 1916 sustaining heavy casualties in the process. A brief period in Belgium followed before a return to the Somme just south east of Pozieres and a dreadful winter during the course of which the Battalion was engaged around Flers, in early November. 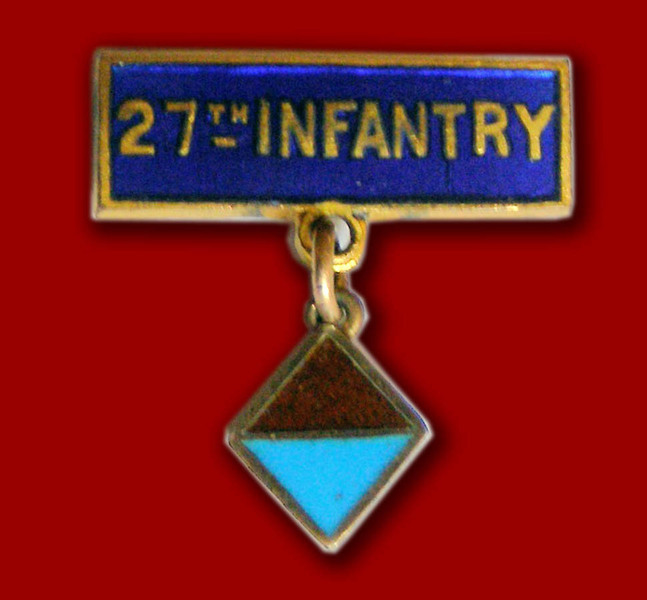 The troops in the field endured the coldest most severe winter in living memory. 1917 saw 2nd Division and the 7th Brigade of which the 27th was a part relocate further north near Arras to take part in the major British offensive of the same name. 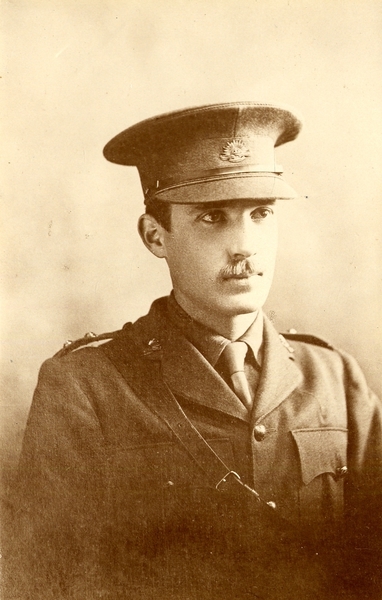 Elwyn had been promoted Captain on the 4th January vice Captain Elder. 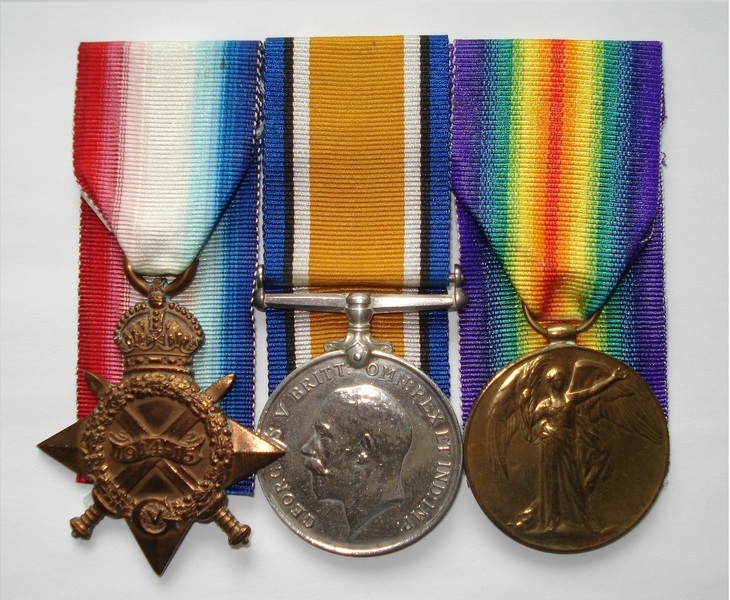 He was not long in action before being seriously wounded by small arms fire near Frecourt on the 22nd February1917, recorded as GSW (interchangeably ‘Gunshot Wound’- the most common use of the abbreviation - or ‘General Shrapnel Wound’, the charactersitics of which were sometimes indistinguishable from a gunshot wound). 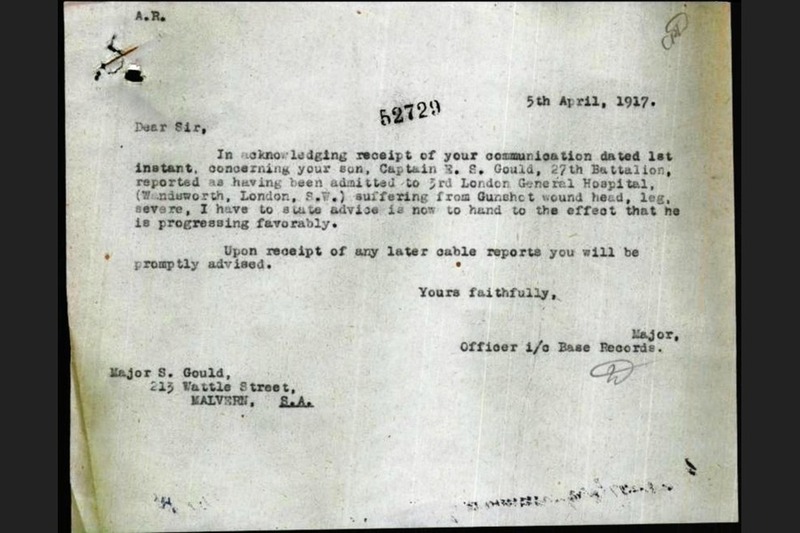 His wounds required evacuation to the United Kingdom and admission at the 3rd London General Hospital, Wandsworth. It appears that he spent four months recuperating before temporary assignment to the 7th Training Battalion on the Salisbury Plain. 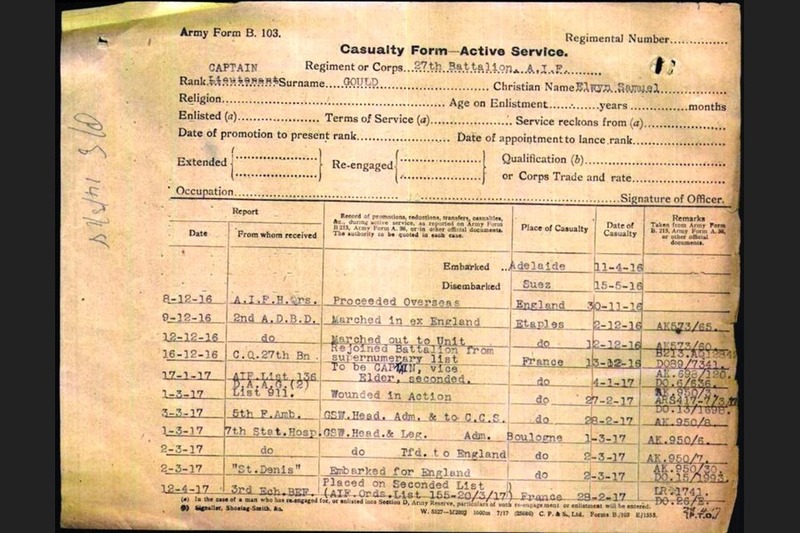 He deployed again to France on the 4th July 1917, and was taken back on strength by the 27th Battalion on the 13th of July. 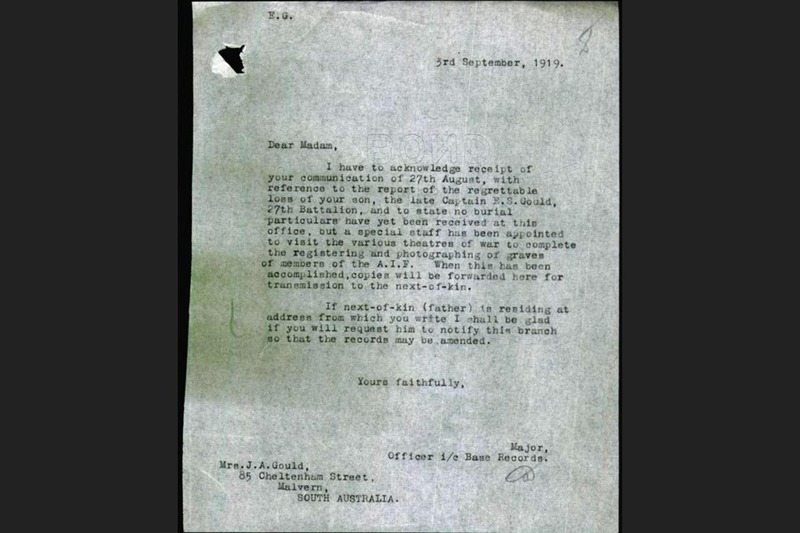 The 27th Battalion was shortly afterwards committed to the Third Ypres campaign, beginning with Menin Road and Polygon Wood and culminating in the fighting at Passchendaele. 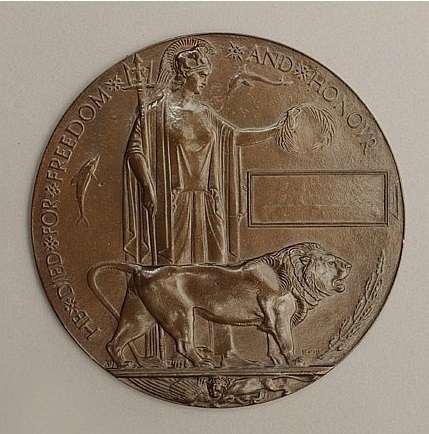 Elwyn Gould was killed on the 9th October 1917 in the preliminary stages of Passchendaele. The Battalion at the time was located near Broodseinde, to the south of Passchendaele. 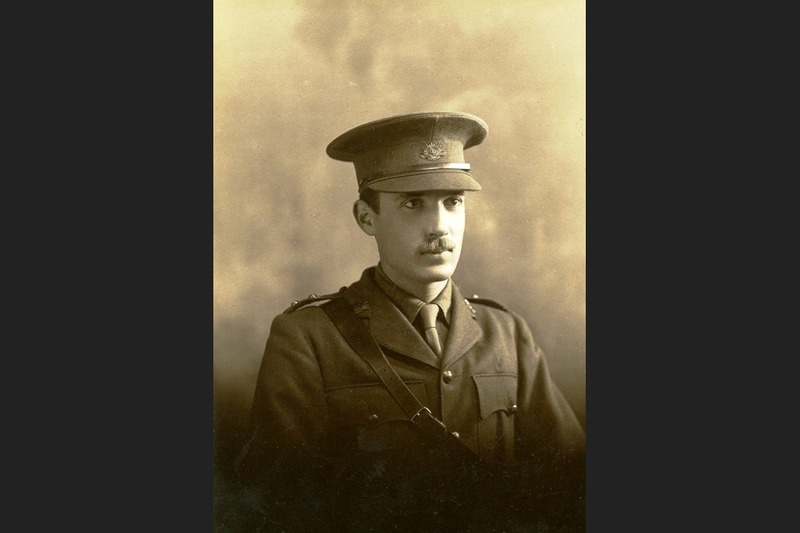 It is notable that Elwyn’s story closely parallels that of Reginald Bruce Coulter (warmemorial.erato.vm.e2.com.au), from Gallipoli to Ypres. Showing 4 of 29 images. Click images to start slideshow.